You may be wondering if your employer is paying you the appropriate minimum wage. The Fair Labor Standards Act (FLSA) requires employers of covered employees who are not considered “exempt” to pay these employees a minimum wage of $7.25 per hour. Keep in mind, this is the Federal minimum wage and various states may have their own wage and hour laws. For instance, New Jersey’s minimum wage rate for 2019 is $8.85 per hour. The FLSA also lays out which category employees of employees are exempt from minimum wage requirements and/or overtime pay requirements. 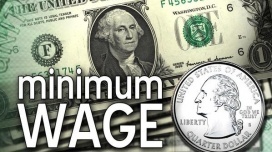 Minimum wage for people under 20 years old, the law permits employers to pay these employees a minimum wage of $4.25 an hour for the first 90 calendar days of employment. Employers are not allowed, however, to replace these younger employees every 90 days to maintain this youth rate. The FLSA also permits employers to pay what is called a “piece rate basis.” This typically occurs with tipped employees such as bartenders and servers (i.e. those who customarily receive more than $30 a month in tips). The employer may consider the tips part of the wages but must pay these employees at least $2.13 per hour if the employer claims a tip credit. While there are many other requirements, one additional one is that the employees must receive at least the equivalent of the minimum hourly wage rate ($7.25) and overtime for hours worked in excess of 40 hours per week. Whether waiting time is hours worked under FLSA depends upon the circumstances. Generally, the facts may show that the employee was engaged to wait (which is work time) or the facts may show that the employee was waiting to be engaged (which is not work time). For example, a secretary who reads a book while waiting for dictation or a fireman who plays checkers while waiting for an alarm is working during such periods of inactivity. These employees have been "engaged to wait." See U.S. Department of Labor, Wage and Hour Division, Fact Sheet #22. The United States Supreme Court has established that “no principle of law . . . precludes waiting time from also being working time,” and that an employee who is “engaged to wait” must be compensated, even though an employee “wait[ing] to be engaged” need not. Skidmore v. Swift & Co., 323 U.S. 134, 136-37 (1944). Whether waiting time is worked under the [FLSA] depends upon the particular circumstances,” such as the “nature of the service, and its relation to the waiting time.” 29 C.F.R. § 785.14 (citing Skidmore, 323 U.S. at 137). “[T]ime spent away from the employer’s premises under conditions that are so circumscribed that they restrict the employee from effectively using the time for personal pursuits. . . constitutes compensable hours of work.” 29 C.F.R. § 785.16(a). Courts have consistently held that “on-call” time can constitute work and is compensable under the FLSA where an employer restricts an employee’s ability to use time freely for the employee’s own benefit. Armour & Co. v. Wantock, 323 U.S. 126, 133 (1944). Employees must be paid for all time worked even if they are willing to work off-the-clock, meaning without compensation. “[A]n employee must be compensated for time she works outside of her scheduled shift, even if the employer did not ask that the employee work during that time, so long as the employer "knows or has reason to believe that [the employee] is continuing to work" and that work was "suffered or permitted" by the employer. Kosakow, 274 F.3d at 718 (citing 29 C.F.R. § 785.11); see also Chao v. Gotham Registry, Inc., 514 F.3d 280, 288 (2d Cir. 2008) ("An employer who has knowledge that an employee is working, and who does not desire the work be done, has a duty to make every effort to prevent its performance. This duty arises even where the employer has not requested the overtime be performed or does not desire the employee to work, or where the employee fails to report his overtime hours."). The FLSA does not limit either the number of hours in a day or the number of days in a week that an employer may require an employee to work, for individuals over 16 years old. Similarly, the FLSA does not limit the number of hours of overtime an employer may schedule, or an employee may work. However, the FLSA does require employers to pay covered/non-exempt employees not less than 1 ½ times their regular rate of pay (time and a half) for all hours worked in excess of 40 in a workweek. Employees who are exempt (ineligible) from receiving overtime primarily perform work duties which are classified as "executive," "professional," or "administrative. See FLSA Coverage. If you believe your employer is not paying you a legal rate of pay for all work time earned, do not hesitate to contact the attorneys at Mashel Law, LLC. Mashel Law, located in Marlboro, New Jersey, is dedicated exclusively to protecting the rights of employees.